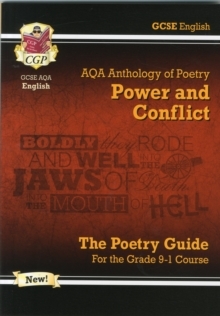 This superb Grade 9-1 GCSE English Literature Poetry Guide from CGP covers the entire 'Power and Conflict' cluster from the AQA Anthology of Poetry. The full text of every poem is included, with clear, concise notes on the meaning, form, structure and language - plus questions to help students develop their personal responses. It's also very important to be able to compare the poems, so we've included in-depth sections on the themes and poetic techniques found in the cluster. There are practice questions and exam-style questions at the end of each section, and the book is rounded off with plenty of detailed exam advice - including the chance to improve and mark sample answers using a realistic mark scheme. Perfect for getting to grips with exactly what the examiners are looking for!